The first part of the sequence of “In Praise of Shadows” is for three paper players and electronics. Interested in the place of collective loss of the tangible in our modern life, it uses the analogue of the excessive illumination in Edison’s modern lighting and its affect on Japanese aesthetics and culture. 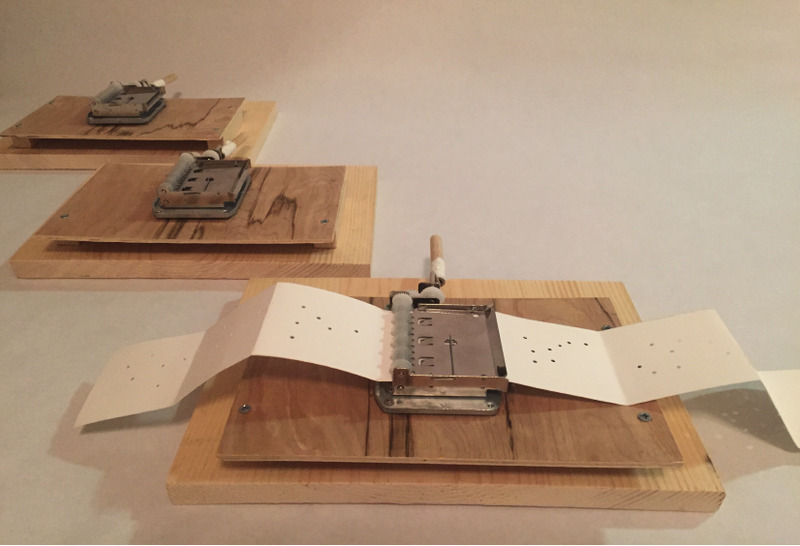 Following this work, “Orison” is composed for three music box players and electronics. The work is motivated by the voices of children during wartime, both from past and present, speaking and singing about hope and peace, as well as the sorrows arising from their personal experiences. These melodies, presented as empty spaces on the music score, reveal as they are fed through the music boxes. This work is inspired by the essay, “In Praise of Shadows” by the Japanese novelist, Junichiro Tanizaki written in 1933, at the birth of the modern technological era in imperial Japan. The essay describes the ways in which shadows or emptiness are integral to traditional Japanese aesthetics in music, architecture, and food, right down to the design of everyday objects. For instance, the depth of color and delicate painting on Japanese laquerwere is designed to be seen in soft candlelight. A type of light quickly becoming obsolete at the time of his writing. As Tanizaki explains, “We find beauty not in the thing itself but in the patterns of shadows, the light and the darkness, that one thing against another creates… Were it not for shadows, there would be no beauty.” Simultaneously, the essay is concerned with how the modern sensibility and excessive illumination of Edison’s modern light affect Japanese aesthetics and culture. As modern life has become increasingly alienated from materiality, pushing into a virtual, digital domain. In Praise of Shadows is an eulogy for our collective loss of the tangible. Using material as actual instrumentation it highlights the real world and our presence within it. This composition is inspired by the well known writings of the Japanese poet, Matsuo Busho. Busho traveled from Edo (modern day Tokyo) northward on the island of Honshu from 1689 to 1691, and as a result left one of the most revered literary texts in Japanese history: “Oku no Hosomichi” (Narrow road to the deep north). This journal contains hokkus that beautifully depict the northern landscapes he visits. Upton his return, he spent the next three years editing the journal. The middle two contrasting movements are more loosely constructed, and inspired by images of landscapes and weather described in his writings. The unmistakable feeling of melancholy in Busho’s last poem, “Falling sick on a journey”, speaks to his love of his native land. Finally, the work closes with an image of Busho’s soul evaporating into the sky while dreaming of the landscapes that he so loves. This work depicts an image of a wind quietly moving above a winter landscape. Gentle noise and airy sound of the strings represent the stillness of cold wind and the particles of air that are gently pushed along by the breeze. This work is centered on the percussion, which directs and controls many aspects of the music materials produced by the five instruments: clarinet, flute, piano, violin and cello. All five instruments have different music characteristics in the beginning. As they slowly emerge into one similar character, the percussion interrupts the movement and forces them to return to their opening gestures. After this process is repeated several times, these five instruments become more eager to free themselves from being controlled by the percussion, and their timbre and rhythm become more complex and frantic. 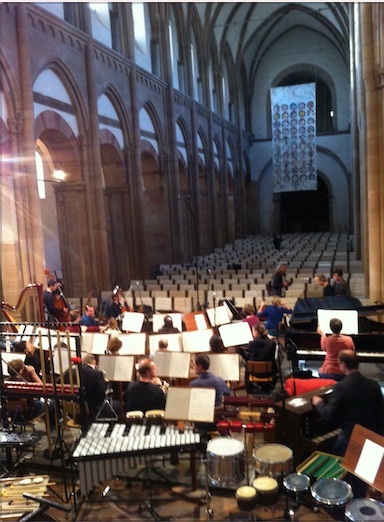 By the end of the piece, the rhythmic expressions of all instruments become increasingly more chaotic. “Minyo” consists of five short movements, which are largely influenced by Japanese folk music. Elements of folk music can be heard directly in the variations of pitch and rhythm. Strings also imitate the sounds of the traditional instruments commonly used in folk music: shamisen (guitar), koto (harp), taiko (drum), and voice. These seemingly contrasting movements are interconnected by the reoccurrence of these four components. The work is inspired by the spirituality and texture of Japanese Gagaku music. Whispers of instruments merge in this cyclic single-movement work.